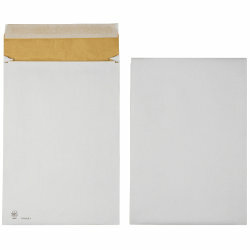 PostSafe Padded Envelopes Extra Large. Seal: peel and seal. Format: C5. Stamp: yes. Printed interior: yes. Hot melt: yes. Envelope quality: economy. Cardboard backside: no. Width: 500 mm. Height: 650 mm. Quantity: 10 pieces. Colour: white. Jiffy Padded Bags MJIB01012. Details: Heavyweight protection. Details: 65% recycled. Colour: Brown. Quantity: 50 pieces.